Many people I've been told that they love the metallic look from Cryo64 Genesis. So, for they I made this version of Ageo. 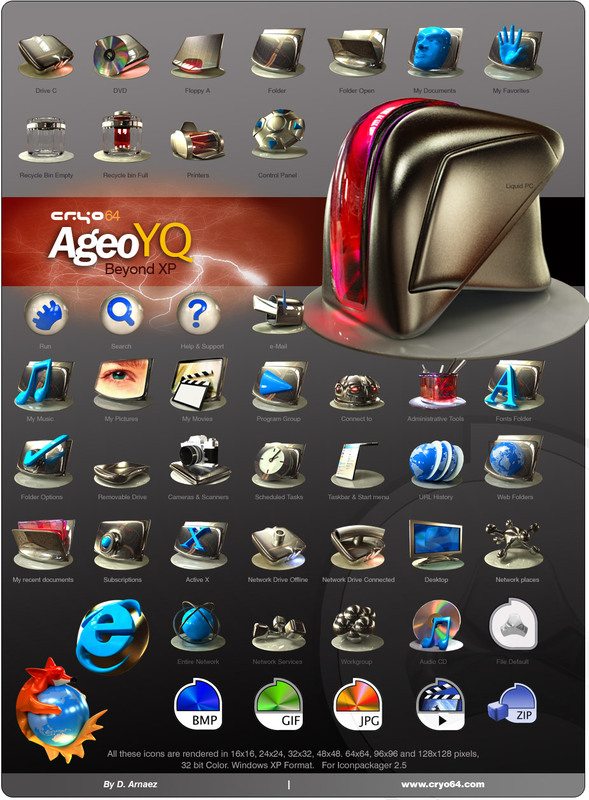 After released the Ageo iconpack, I made a little bit changes like, New icons of Help, find and Run. In this version I use materials like, steel, red glass and blue plastic. The environment is dark giving a special look to the metal. I changed the animated cursor for "Busy". So... do you like metal? Do you love the shines? No more waits, enjoy!!! Link Its a real Cryo Wall "GreenWall"
Link Link Link CryoDock "Metal matte"
WOW ... Rocks everything ..
have ever think to do a black and red icons theme? Very well done; really like the design and colors. Thanks! very HOT. slick, polished - well rendered. they look so.. real!!! oh how i wish they did not have the 'base' - though i havn't downloaded these yet. I love these icons, yours are always good. Isn't the Firefox icon in the preview different than the one in the package? wow...talk about quality...very very nice!!! those are very nice D.
also id like to add, that i Really like that firefox icon, any chance for the 256x256 png? Where is the link for the cursor?